A ten year, multi-million pound campaign to reverse a developing but invisible pollution problem in the waters and meres of the Lake District, has reached a turning point. The pollutant in question is phosphorus - used in detergents and fertilisers, produced by animal and human waste. 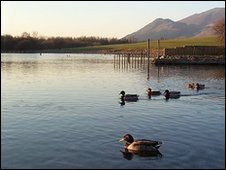 The Bassenthwaite Lake Restoration Project is now reaching its first decade - work is starting to develop a similar project around Windermere. 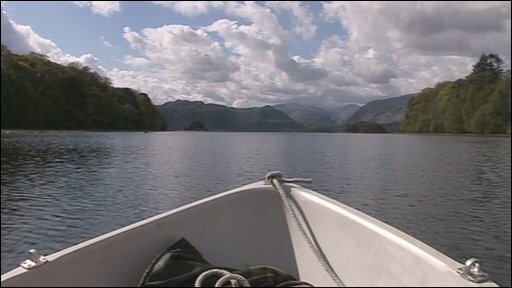 Eric Hope has been fishing the waters of the Lake District since he was a boy. He casts a plastic lure in the shape of a fish into Derwentwater from his boat, Doghouse 2, knowing that it's unlikely he'll catch a pike anything like as large as he would expect twenty years ago. "We no longer get the really big ones. Twenty years ago you might catch a 20 pounder. You'd get plenty of 17 or 18 pounders. I can't remember the last time anyone caught an 18 pounder. "Pike are the top predator and if they're in trouble, the other fish will be as well." Scientists say there are many possible causes for this - and the sharp decline in the numbers of trout in Windermere. There are invasive species - of waterweed like crassula, introduced for fish tanks but now swamping parts of the lake bed, or fish like roach and ruffe, often brought in as live bait by anglers. This is now banned. But two common themes, that have made the water far less suitable for its traditional species, and more suitable for those invasive species, are phosphorus and climate change. Phosphorus makes compounds called phosphates. You can't see, smell or taste them - but in the long term they're almost as damaging as a supertanker load of crude oil. Phosphates enrich the water, with the most visible result being blooms of algae, including the blue-green variety that creates a toxic scum at the edge of the lake. In recent years warning signs have been placed around lakeshores almost every summer, telling people to keep pets and children away. The warmer the water, the more fertile phosphates make it - so the gradual warming of the lake waters, almost certainly a symptom of climate change, will make matters worse. 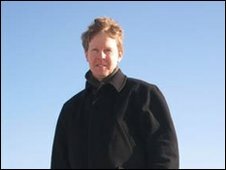 Dr Stephen Maberly works for the Centre for Ecology and Hydrology. He'll tell you that roughly half the phosphates in Windermere come from the sewage works, and half from the land. "Farmers will put fertiliser on their fields, and some of that will wash into the lake. Humans use detergents and dishwasher tablets, and human waste too will feed into the lake." The problem with phosphate chemicals is that they dissolve in water, and flow straight through a sewage works. Twenty years ago equipment was installed in Windermere's waste water treatment that would make the phosphates turn into solids so they could be screened out. That made a difference for a while - but the level of the compounds still isn't back to where it should be. 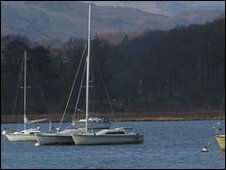 Up at the other end of the Lake District, millions of pounds is being spent to try to reduce the amount of phosphates going into Derwentwater and Bassenthwaite. £4 million per year comes from the Environment Agency, which is leading the restoration project. More comes through what's called "catchment sensitive farming"
Anne Cornthwaite and her son Henry run Ashness Farm. The spectacular views from her farmhouse windows look straight down across Derwentwater to Bassenthwaite. 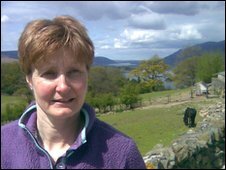 The run-off from her farmyard manure heap makes a similar journey - just like that from 100 other farms in the area, Ashness Farm was putting too many phosphates into the lakes. With the help of grants from the catchment sensitive farming project, and her landlord the National Trust, there's now a new building at the end of the farmyard. It will house the manure until it can be spread on the land next spring. The run-off will be kept in a septic tank. Down in the valley, more than 200 tourism businesses are being urged to use only phosphate-free detergents. The encouragement's being done by Ruth Kirk, under a scheme called Love Your Lakes. "It's a very simple message," says Ruth. "The only reason the phosphates are in the detergents and the dishwasher tablets is to make the water soft. The water in the Lake District is soft anyway, so they're not necessary." The whole project, for ten years, has dominated the life of John Pinder from the Environment Agency. Now, he says, he can finally see a difference. "We were seeing phosphate levels in Bassenthwaite, for instance, of round about 32 micrograms per litre - that's a measurement we use. "We're now down to round about the 23 to 25 mark. The objective that we're aiming for in the long term is round about 14, so we're well on the way. "The deterioration's been going on probably since the beginning of the 20th century, so we're halfway to achieving that in just ten years." Another contribution's made at Keswick's sewage works, where as part of a £12 million investment by United Utilities, new equipment means 80 per cent of phosphates will be taken from the outflow, compared by 50% now. So the phosphates are being stripped out. On the hills, hundreds of trees are being planted to reduce the amount of sediment going into the lake - another cause of changes that according to Dr Ian Winfield from the Centre for Ecology and Hydrology, could lead to the 'Essexification' of the Lakes. "I've nothing against Essex, but their lakes have fish like roach and bream, and ours should have cold water species like trout, arctic char and schelley." But things may have already gone too far. The rare vendace, a survivor from the ice age, hasn't been seen in Bassenthwaite since 2001. Luckily, there are still some in Derwentwater and the genetic stock was saved by moving some into lakes in Scotland and elsewhere in the Lake District. But in the broad flat water that fills the bottom half of the vale of Keswick, we've effectively seen a species become extinct.